Rote and without a hint of much of his own style, The Magnificent Seven somehow manages to feel like a weaker carbon copy than a redo of the 1960s classic. This time around, Denzel Washington leads the pack as Sam Chisholm, a newly sworn warrant officer. Riding into town with nary a comment but with every head turning as a black man heads down their street, Chisholm is asked by widowed Emma Cullen (a largely underused but pleasingly effective Haley Bennett) to avenge her husband's death and free their mining town from the tyrannical grip of Bartholomew Bogue (Sarsgaard). Gathering up a motley crew of multi-racial misfits (one of the more revisionist edges that Fuqua gifts the reboot), Chisholm and his man saddle up for a fight. The Magnificent Seven is nothing in comparison to the 1960s John Sturges' western which housed the likes of Yul Brynner, Steve McQueen et al. Mixing in characters that feel under written and giving them stock-standard scenes where they literally say they are bonding is not a key to emotional success when the final shoot out begins. Equally, it doesn't help that the bad guy of the piece looks dead behind the eyes and appears indifferent to these meddlesome seven in the final wash; in fact Sarsgaard looks like he's stepped in something again and is wasting his time wiping it off. 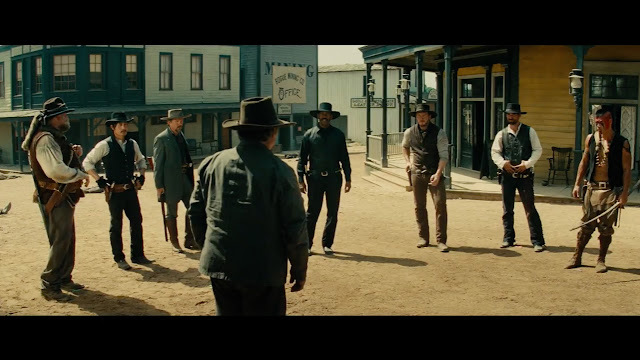 Using Sergio Leone style close ups, hints of the original theme and gifting everyone a posturing close quarters pose, the movie feels like Fuqua and True Detective writer Nic Pizzolatto have created a carbon copy of a western but forgot to add the heart and soul of what made The Magnificent Seven work in the first place. At least 50% of the Seven are fleshed out - though a personal connection to Bogue is hardly necessary - but yet all of them manages to feel like a lazy once over. From wise-cracking Chris Pratt's card-dealer sharpshooter to Ethan Hawke's former Confederate sniper and now traumatised gunslinger to Sensmeier's Indian whose perfect face paint is more charismatic than anything he does, Fuqua's eye is not on character but on execution of action. And to be fair, even though he uses some of the familiar Equalizer traps and tricks to help the group despatch the baddies, the shoot-out at the end feels like waves of faceless bad guys being despatched by a group who you can barely keep up with. It uses all the tenets of a Western stand-off; from guys falling off roofs to confusion, but it hardly warrants the long build up to the pay-off. It's a shame because the start channels the old John Ford westerns with shots of great sweeping countryside, snatches of a great James Horner OST, hints of the old Magnificent 7 theme and the tried and tested cinematic formulae to help set it all up. And when Denzel rides through town, you can cut the tension with a knife. 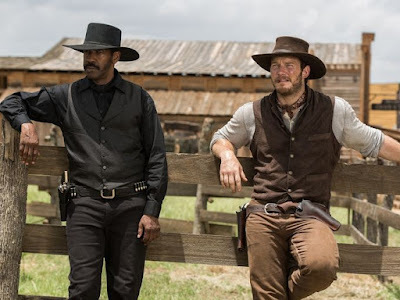 But the set-up also becomes The Magnificent Seven's weakness as the script uses Pratt's outlaw charm as a crutch and D'Onofrio's size and shape as he quotes scripture in a high voice to propel it - and it's not enough. And the final shot with its almost painted on coda is frankly close to insulting and an execution of a terrible pun on the title which is unwarranted and unwelcome. Ultimately, the 2016 version of The Magnificent Seven comes up wanting - it strives for epic Western, but falls short. Despite its competent and workmanlike handling on-screen and its intentions, it's less Magnificent, more Meh-nificent.